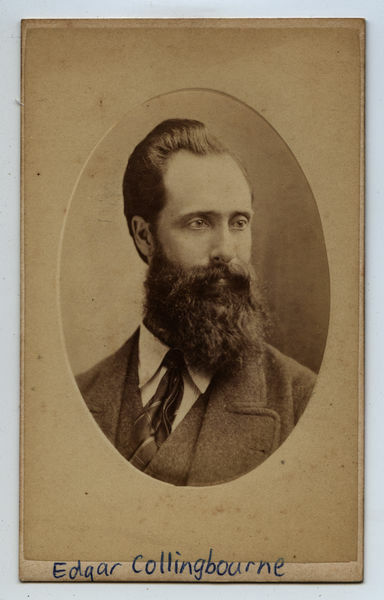 Through several of my earlier posts on Trove Tuesday : The family of James Muir and Trove Tuesday : Identifying James Muir, I have managed to identify the individual in this carte de visite as James Muir, the brother of the Georgina Auld nee Muir. There is no imprint on the front face. As mentioned in my earlier post on Identifying James Muir, the name written in ballpoint pen on the front face is 'Edgar Collingbourne'. This name appears to be fictional and does not correspond to any family members that have been uncovered to date. The history of the ballpoint pen also needs to be taken into account, as the first patent for the ballpoint pen as we know it today was not filed until 1938 by Hungarian newspaper editor and inventor László Bíró. Market saturation of this type of pen varied by country, but it really didn't take off until post-war late 1940s and early 1950s. From this information we can safely say that the name was written well after the date that this photo was taken. 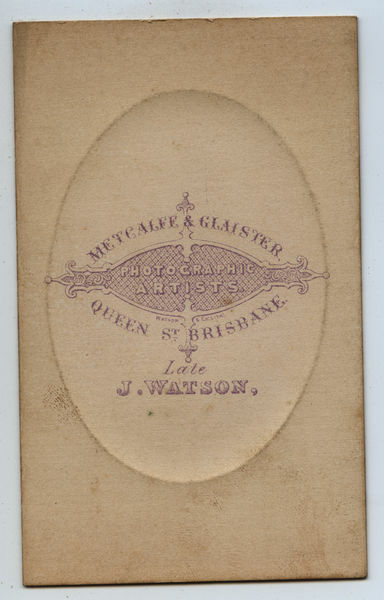 See Trove Tuesday : Metcalfe & Glaister [Photographers] for more information on Metcalfe & Glaister and their photographic studio in Queen Street, Brisbane. As discussed in that post, the documentary evidence based solely on the information provided on the back imprint dates the photo to 1875.